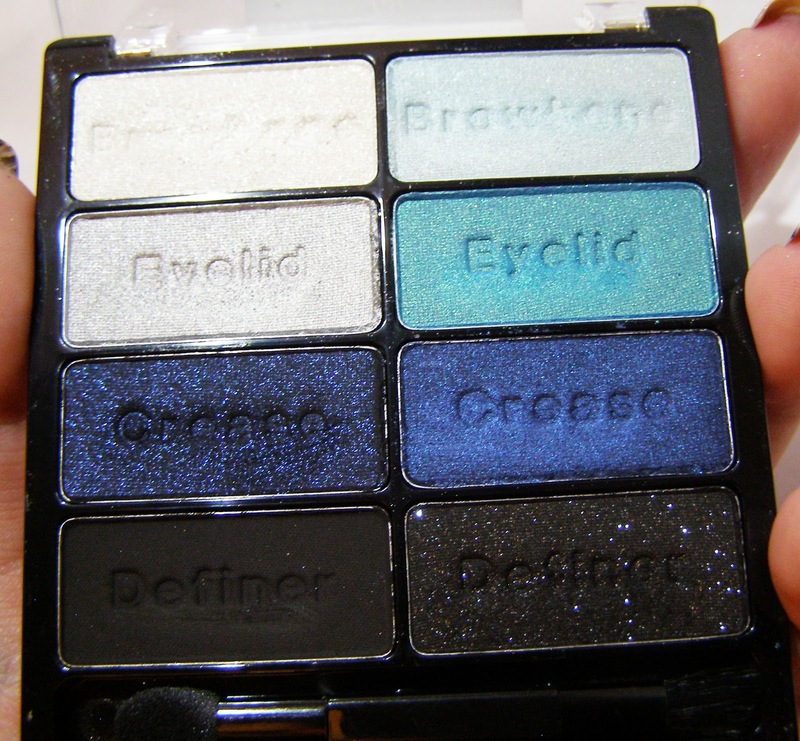 The second Wet'n'Wild palette I grabbed (they were on sale, dammit.) is "Blue Had Me at Hello". 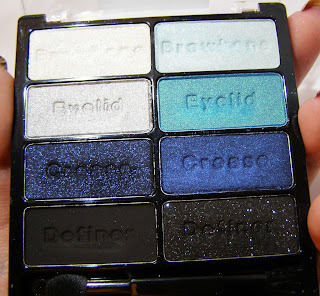 It's an...octuplet palette? Is that the right term? I dunno, but lets just call it the Octopus Palette from here on out? It's a really pretty blue-to-turquoise collection...and I love it. I used the three colors on the right all together and it looked great. I did have a flash of "omg am I wearing 3 different shades of blue eyeshadow together?" but I stifled that and went on about my day. Inspired by the whole "30 days of Makeup" thing, I've been trying to wear makeup everyday...even if it is only for a few hours at a time. the Octopus, it all its glory. The pigment is about the same as the previous palette. The only disappointments were the deeper colors. There wasn't a huge difference between the navy, the black sparkle, and the matte black. That was a bummer. The sparkly navy was all about the glitter...you definitely need to pat that stuff on rather than brush. It came with a brush and a sponge applicator, but honestly I think those are both throwaway bits. This ran me about $3 as well, and I must say I'm happy with my purchase. It has the same instructional embossing, which I completely disregarded. Though I might try one day to follow the intructions, just to see what hellish concoction I end up with. The internet might like to see that. 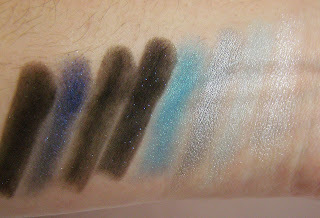 swatched with the sponge tip applicator.